How we choose to use our points is a very personal thing. Some of us are Weekend Warriors. We like to get away for lots of long weekends here in the US. Others of us like to take luxury vacations, choosing to fly in first class and staying at 5 star hotels. Others may choose to travel the world for weeks at a time staying at mid level hotels. All these travelers require a different miles and points strategy. Failure to execute the proper strategy can waste money fulfilling minimum spending requirements on a card with a bonus that is not useful to your travel needs. The Weekend Warriorwho takes lots of 3-4 day trips with their spouse here in the USwould greatly benefit from the Southwest Airline companion pass. This is one of the best airline perks in the industry. Unlike companion passes with other airlines, the Southwest pass is reusable for up to two years! This means your travel partner (that you must designate) can travel free on your itinerary, even when booking with points. This can stretch the value of your rewards points by twofold. You can obtain up to 100,000 of the 110,000 points necessary to earn the companion pass by signing up for a business and personal Chase Southwest Airline cards. The other 10,000 points can be transferred from another program such as Ultimate Rewards. In other words, you may never have to board a Southwest plane to earn the companion pass. How great is that? On the other hand, a Luxury traveler may not want to hassle with Southwest Airlines boarding policy. They don’t offer advanced seating. You have to check-in for your flights 24 hours before boarding and hope that you don’t get stuck with a “C”boarding pass. That probably means you are sitting in the middle seat. Yuk! The Luxury traveler likes sitting up in the front of the plane, and staying at the World’s best resorts in suites. This type of travel requires a strategy that maximizes the use of spending, to gain status with the hotels and airlines so that you have the best chance of being upgraded. Two credit cards that give you elite status for spending are the Citi Hilton Reserve card and the Starwood Preferred Guest cards. With the Hilton card, you get Hilton Gold status just for having the card. With $40,000 of annual spending, you get Diamond status. The Amex Starwood card gives you Starwood Gold status for a $30,000 annual spend. For those not familiar with the Starwood chain, it has nine brands including the Sheraton, W, Westin, and St. Regis Brands. The Chase Hyatt card gives you Hyatt Gold Passport Platinum status just for having the card. Having mid or top tier status with hotel chains gives you an very good chance of getting preferred or club floor rooms and suites; something the luxury traveler appreciates. One excellent use of Dentist B’s points would be to take advantage of an AXON award. An AXON award is a discount to the typical award points needed by virtue of the fact that you have the Hilton Amex card. 195K Hilton points would entitle Dentist B to 5 nights at top category 7 Hilton properties like the Hilton Sydney or the Waldorf London. Combining an AXON award with the two free weekend nights, Dentist B could also use his 100K AA miles to fly himself and his spouse first class domestically and stay at a Hilton category 7 property like the Hilton Sedona for a week. Pretty nice and almost 100% free! After returning from that trip, Dentist B could then use 110K Ultimate Reward (UR) points and convert them to 110,00 Hyatt points. Ultimate Rewards points are widely considered to be the most valuable reward points as they have tremendous flexibility. They are also the easiest points to accumulate in large numbers by virtue of the many bonus spending categories available. They can be transferred to a wide variety of hotel and airline programs. Combining the 110,000 Hyatt points with the 2 free Hyatt nights he received with his first purchase on his Chase Hyatt card, Dentist B could stay at a top category 6 Hyatt property like the Park Hyatt Beaver Creek or the Park Hyatt Sydney for 7 nights. He would still have almost 100K URpoints leftover to convert to airfare for that same trip. After all those redemptions, Dentist B still has 55K Starwood points left over. That’s enough points for a 5-night stay at a category 5 Starwood hotel using the Starwood 5th night free option. The 5th night free options can be used whether you pay for the first 4 nights with cash or points. You can stretch Starwood points even further by using a great Starwood benefit: Their cash and points option. With this option, you can use fewer points to book by paying a very reasonable amount of money in addition to the points. If Dentist B preferred quantity to quality, he could fly Coach instead of First Class, and stay at mid-level hotels instead of luxury hotels. Dentist B could probably stretch the number of free weeks of hotel and flights to four or five. All of this free travel is with ONLY $112,000 worth of spending. Imagine the possibilities of putting the spending power of your office to use! I would like to impress a couple of very important things upon you before you get started. The first thing is that you MUST have a travel goal in mind before you start signing up for credit cards. You need to do this so that you receive bonuses that fit your travel goals. The second thing I would like to impress upon you is that it is not simply a matter of earning more points and miles. Learning how to maximize their usage is at least as important to your travel rewards. For example: Did you know there is a way to travel short and medium haul non-stop flights like NYC-Chicago for as little as15,000 milesroundtrip? How about New York-Miami for 15,000 miles or New York to St. Thomas, Antigua, St. Kitts, San Juan, or Turks & Caicos for 20,000 miles? You can also book a LAX-Honolulu flight for 25,000 miles. It can be done if you know how! 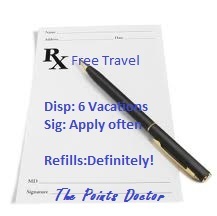 To find out more about maximizing your miles and points, please visit my blog @ www.ThePointsDoctor.blogspot.com. Earning sizable numbers of miles and points involves some extra thought as to how you spend your office and personal dollars. It does not require you to spend any more money than you are already spending. The rewards of a focused credit card strategy can be spectacular. I just say “Thanks to the Banks”. Now if I could only find a way for my staff to accept credit cards payments for their salary… Lol. For more information about earning points and miles, creative ways to maximize their use, and one click sign up links for the current best credit card offers, please visit my blog at: www.ThePointsDoctor.blogspot.com. The Points Doctor is Bruce J. Wilderman DDS of Artistic Expressions Dentistry. Dr. Wilderman has a practice limited to Cosmetic Dentistry, serving patients of the Philadelphia Area since 1986. He and wife of 30 years enjoy traveling the world for little or no money with the points and miles they have earned from the credit card companies. Dr. Wilderman would love to teach you how to do the same. You may reach him at ThePointsDoctor@comcast.net or visit his blog at www.ThePointsDoctor.blogspot.com.